One of the things I miss most about growing up in a small town is having the space to garden. When I was a kid, my dad and I planted a vegetable garden every summer and we grew squash, corn, beans, pumpkins, carrots, and potatoes. My dad is the sort of gardener who follows the directions on the seed packets to the letter. 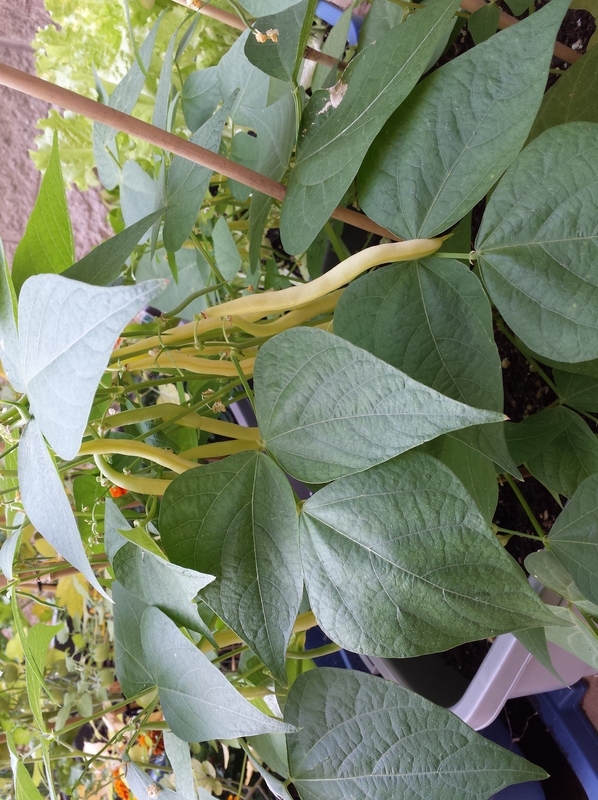 For example, when planting beans, he’d use a length of twine to create a straight line across the garden plot, then we’d go along the string with a ruler to plant the bean seeds – two in each little hole. During the summer months, I’d earn my allowance by weeding and watering. When it was time to harvest, my mum would can, freeze, or make soup out of any vegetables we couldn’t eat. Since moving to Toronto, I’ve lived in apartments with teensy balconies or no outdoor space at all. In my current apartment, I’m lucky to be on the ground floor and have a huge back patio that gets a lot of sunlight. 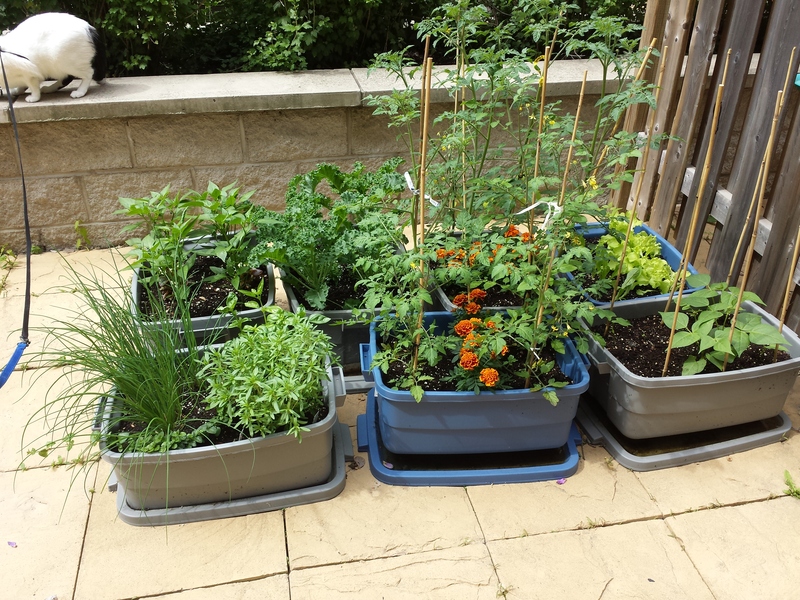 Last summer, I experimented with container gardening, using storage totes to hold mini gardens. I was able to grow a few vegetables, but my soil had problems with drainage and some of my plants didn’t fare so well. This summer, I improved my system by adding a layer of rocks and changing the mix of soil I use. Plan out how much you want to grow and figure out how many bins you’ll need. 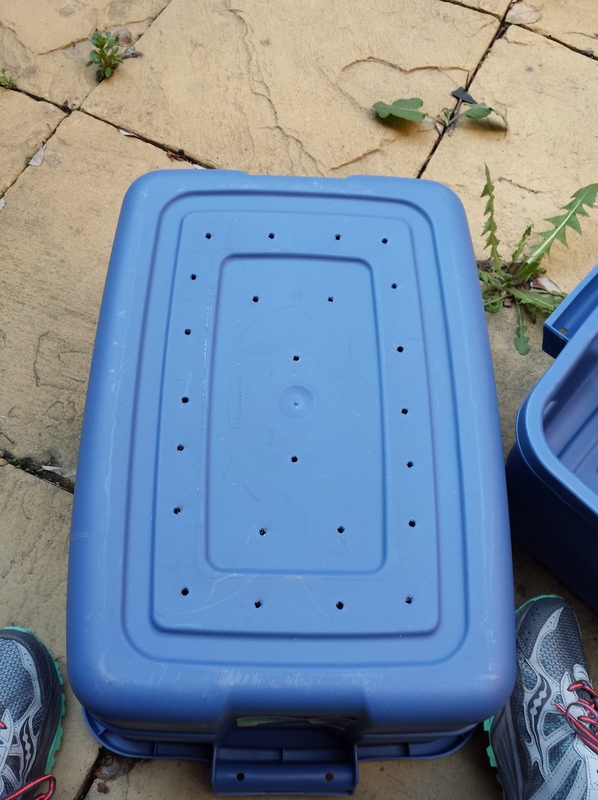 In my experience, one 38L tote bin holds about four plants. 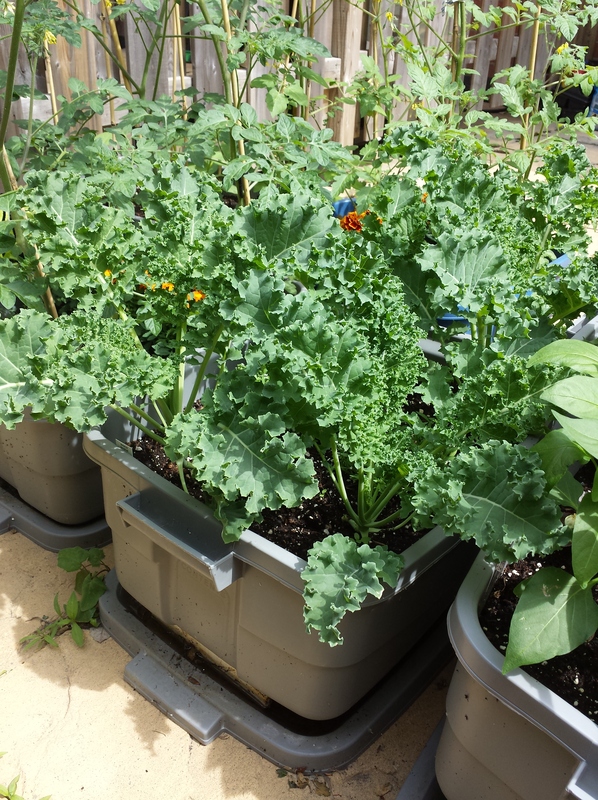 This year, I grew eight cherry tomato plants, four hot pepper plants, four kale plants, as well as lettuce, string beans, and herbs – seven bins total. Drill holes in the bottom of the bins to allow water to drain out. If you don’t have a drill, you can twist a screwdriver into the plastic to make holes. You’ll need quite a few holes, spaced a couple of inches apart. Add a layer of rocks to the bottom of each bin, making sure there are enough rocks to completely cover the bottom. 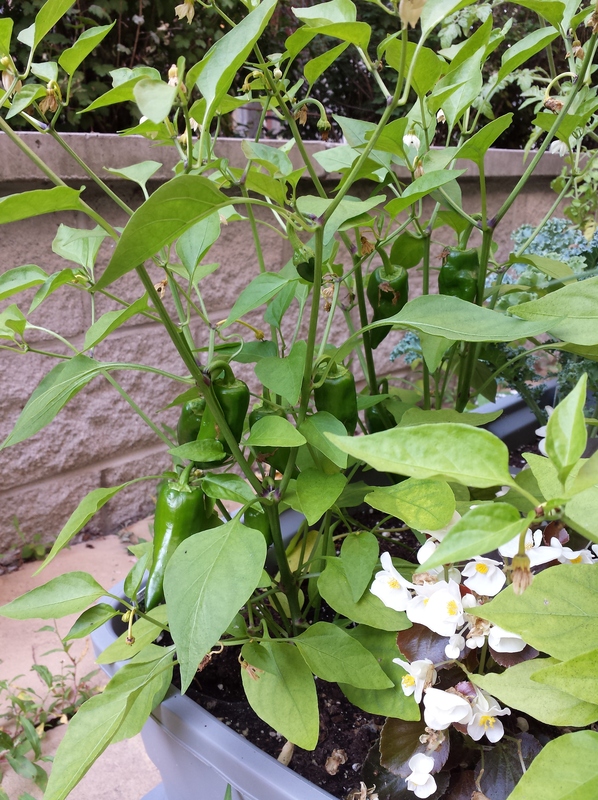 This creates space beneath the plants for your soil to drain. I used landscaping rocks from the garden centre. Add your soil. 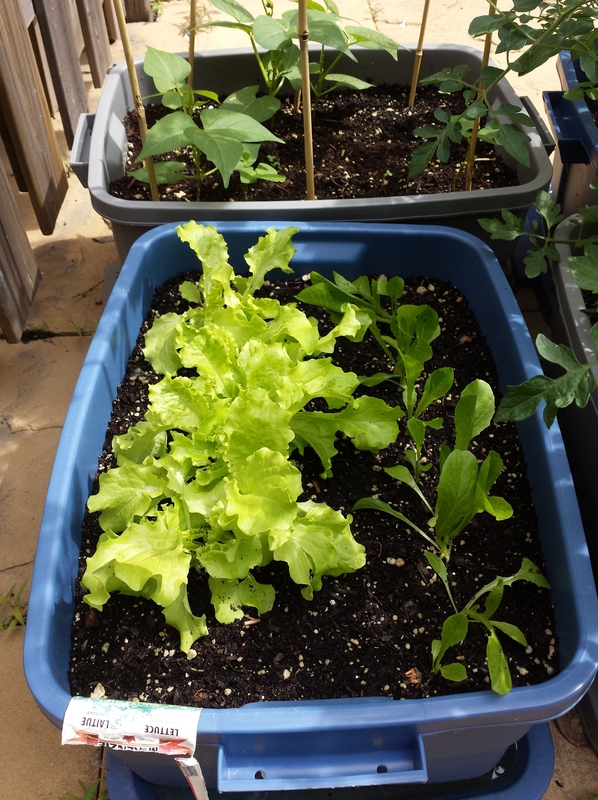 I used a 50-50 mix of potting soil and garden soil to help boost moisture retention. For every ten scoops of soil, I mixed in a scoop of manure. After you’ve added your soil, the bins will be quite heavy. Prop the bins up. I set the lids of the bins down, label side up, then used chunks of styrofoam (leftover packing materials from my move) to prop the pins up a few inches from the lids. What good would all that drilling be if we set the bins directly on the ground, covering the holes? Planting time! I planted seven bins this summer: two bins of cherry tomatoes (four plants each); one bin of kale (four plants); one bin of hot peppers (four plants); one bin of beans (six plants); one bin of lettuce (one row of romaine, one row of boston); and one bin of herbs (one each of: basil, savoury, mint, and chives.) I also added some annual flowers in between my vegetable plants to give the garden a bit of colour. After planting, I moved my garden into a sunnier part of my patio. One advantage of using storage totes is that they come with handles! For the first two weeks, I watered my garden every day. Once the plants were a bit bigger, I switched to watering every second day. 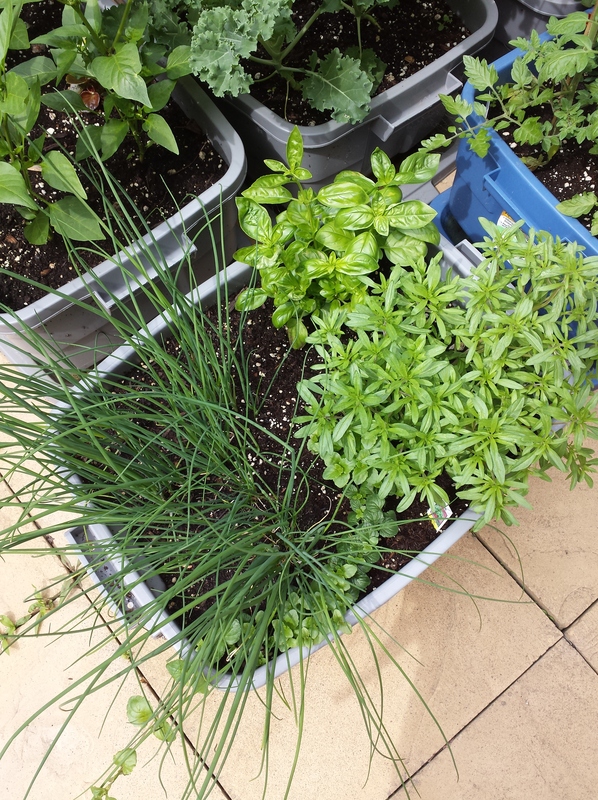 Another advantage of container gardening: almost no weeding. According to the pedometer on my smartphone, it’s 3.2 kilometres from my apartment at Queen and Dufferin to my office at College and Bathurst. My twice-daily trip takes me past art galleries on Queen West, through the dewy grass of Trinity Bellwoods, and up streets lined with bay-and-gable houses. With a stop for a morning coffee or croissant, the walk takes just shy of 40 minutes. 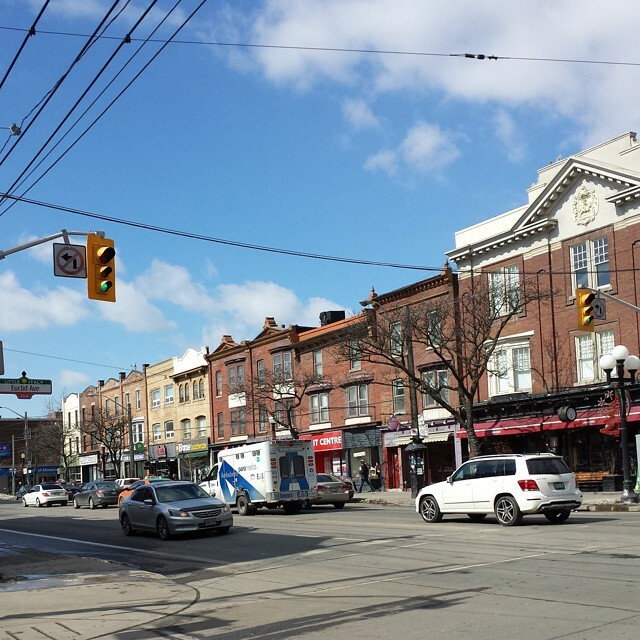 I’m lucky to live in a walkable city made up of a dense, interesting mix of neighbourhoods. My walking route rarely changes, yet there’s always something new at street-level: a vintage clothing store opening, a sidewalk sale, an impromptu picnic, a lineup at the gelato place, street performers, new street furniture, festivals, baby leaves on the trees, huddles of hipsters outside the Drake. Walking reminds me that the city around me is always changing. And that there’s always a need for change. 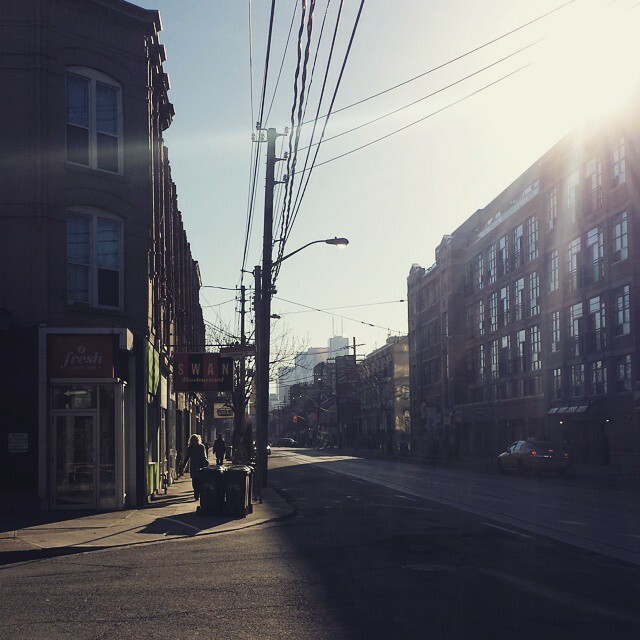 I walk through Queen and Ossington, past CAMH, where I recognize the faces of panhandlers and morning wanderers who I share the sidewalks with. Street poverty stops being anonymous when you notice that the man who smokes in the bus shelter has gotten a fresh haircut for the summer. 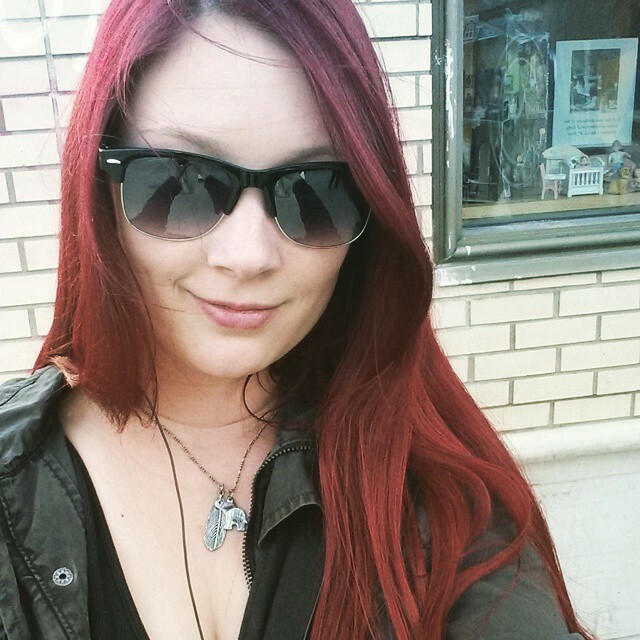 A little over a year ago, I was living in midtown Toronto and working in Guelph. Not wanting to spend the money or the carbon on a personal car, I traveled by TTC and Greyhound bus. Streetcar, subway, walk, bus. The trip took about two hours each way and was prone to delays, especially during the winter months when storms and ice guaranteed truck and car accidents on the 401. My quality of life has improved dramatically. I’m happier and, logging upwards of 10,000 steps a day, arguably healthier. Since walking costs nothing, I’m saving money, as well as time and carbon. There are no traffic jams on sidewalks, and no dreaded short-turns. During the winter months, public transit is still an option, although I managed to walk most days. There’s no such thing as bad weather, my dad used to say, just bad clothing choices. During the minus 30 days, I trudged along snow-logged sidewalks in thick winter boots, thighs swishing in my snowpants. In the right outerwear, walking an hour sure beats standing in the wind twelve minutes, waiting for a streetcar that’s half-likely not to have space for new passengers. I may not always live in downtown Toronto, but I’ll certainly choose to live and work in places that are friendly to pedestrians. Last week, I co-presented a seminar on “Social Media Engagement” at the University of Guelph’s Writers’ Workshops event. Our audience was hugely engaged and we spent much of the seminar answering questions and polling participants. One of the things I like best about presenting to a large group is “matching up” audience members based on their questions and comments. For example, if someone asks about content strategy and someone else has a great example of an editorial calendar, you can suggest that those two attendees chat after the session and learn from each other. Social media is about collaboration. Image courtesy Tomas Laurinavicius, http://getrefe.tumblr.com. Because our audience was so engaged, my co-presenter and I ran out of time and weren’t able to cover all of our talking points. We summarized our remaining points quickly and gave audience members a chance to come up to us after the session to discuss more specific case-based questions. One of our audience members, who’d been using Twitter to promote a local business for nearly a year, asked about Twitter lists and how they could be useful. This is a question I’ve answered before and I’m always surprised by how few Twitter users actively create and sort using the list feature. Users can create and curate their own lists, sorting the people they follow into categories. Users can also choose to subscribe to lists created by other users. If you follow hundreds (or thousands) of Twitter accounts, lists are one of the best tools to cut through noise and focus attention on the people you want to engage with most. **Note: you don’t have to follow an account to add it to a list. This is helpful if you unfollow someone, but want to keep them in a list. News aggregation. Include local, national and international news sources, as well as accounts for news magazines, correspondents, pundits and columnists and you have a personalized new feed that updates hundreds of times a day. Engaging with industry peers. If I follow other Twitter users after a conference or networking event, I include these users in my “PR & SM” and/or “Higher Education” lists. 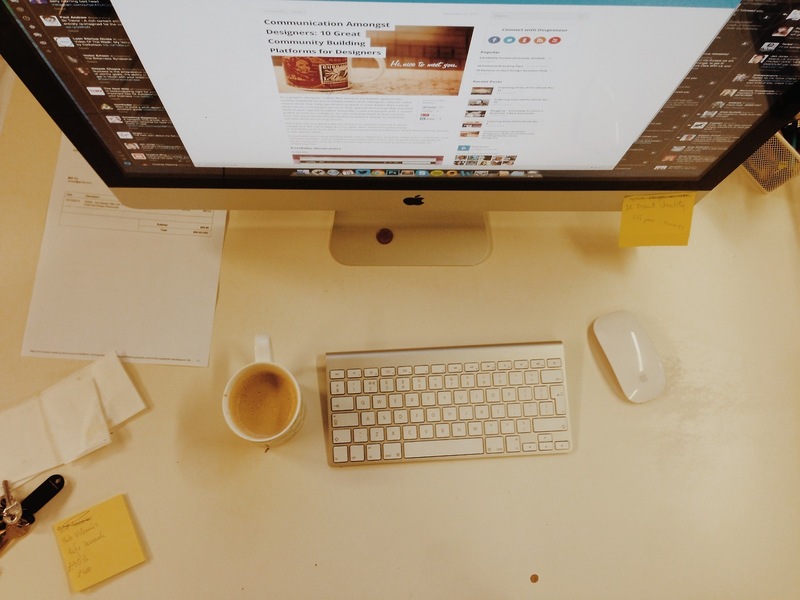 It’s a handy way to keep track of contacts and get quick updates from fellow communicators. This also helps me to remember how I “met” someone or why I’m following them. Finding concerts and events. Think: musicians, concert promoters, venues, community event listings, etc. Tracking my interests. I’ve used lists to curate content from users and organizations who are thought-leaders in urbanism, public space, alternative music and Toronto politics. Watching traffic. As a long-distance commuter, knowing about traffic slow-downs in advance can help me plan my trip to work. If I’m stuck in traffic on public transit, knowing the reason for the hold-up helps to alleviate some of the “but, why? ?” stress and helps me predict how long it’ll take for me to reach my destination. On the Twitter platform, you build lists by adding people one at a time. If I’m looking to do mass changes to lists, I use TwitListManager, which has a checkbox-style interface for building lists from people you already follow. Lists can be displayed within Twitter under the lists tab on your profile. If you’re using an application like HootSuite or TweetDeck, lists can be displayed in custom streams of tweets. The latter is useful if you’re managing a brand account and want to target engagement effort into people who are closest to your business or organization. In this case, I’d recommend using one or more private lists. What’s the most useful Twitter list you’ve created or subscribed to? Stock photography is a tricky beast. As a communicator and (occasional) graphic designer, I’ve relied on stock photos as background images, accents in layouts and to fill “graphic holes” in web and print pieces. The trouble with stock photography is that it can be stiff and many photos are over-used. When working on personal or not-for-profit projects, I don’t always have budget for occasional stock photo use, so finding free and/or creative-commons licensed photos is a priority. Over the last year, I’ve culled together a bookmarks tab of sources for free stock photos. Flickr Creative Commons: photos by amateur and professional photographers who are part of the Flickr community. Attribution is good to include, but not always necessary depending on the license. I like that Flickr is easily searchable and includes a huge range of photos. Because this source includes a lot of amateur work, quality can be variable. Wikimedia Commons: Wikipedia’s multimedia portal, all content is free to use under a Creative Commons license. MorgueFile: a searchable database of high-resolution stock images. Their collection isn’t as vast as Flickr’s, but MorgueFile has a great community of photographers and content creators who both upload and download. Free Range Stock: a sizeable collection available to anyone who opens a free account. A lot of their photos have that “stock photo” look. Open Photo: like MorgueFile and Flickr, this is a community-built collection of free photos on Creative Commons licenses. 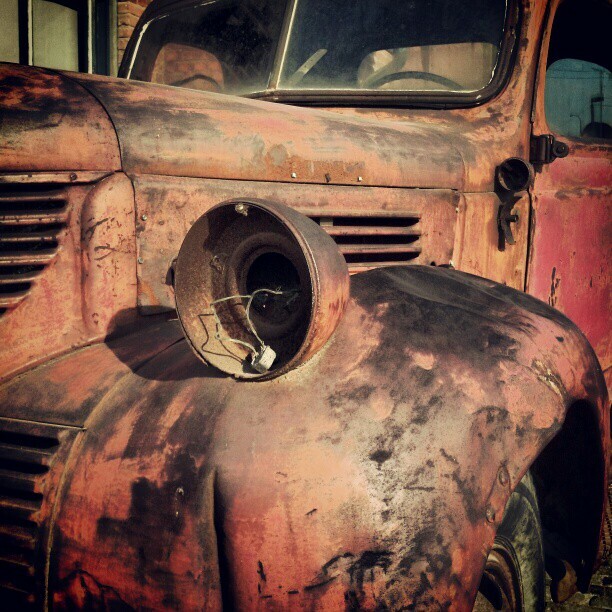 Unprofound: another community-built photo collection. I like that Unprofound lets users you search photos by dominant colour, which can be handy. Little Visuals: subscription-based. The website emails a zip file of 7 photos every week to your inbox. Their archive is searchable. Little Visuals offers mostly textures, close-ups, landscapes and tech photos. Unsplash: like Little Visuals, Unsplash is subscription-based and emails 10 high-resolution photos every 10 days to your inbox. It’s built on a Tumblr blog, which makes searching the archive a bit tedious. Death to the Stock Photo: you’ll need a free membership to browse, but DTTSP’s photos are high-quality and high-resolution. Microsoft Clip Art: this one’s counter-intuitive, but the latest version of MS’s clip art gallery includes some decent-quality stock photography that’s free to use. New Old Stock: vintage photos, scanned from public archives. Also uses a Tumblr format, so you may need to try a few keywords to find what you’re looking for. Picjumbo: a personal project of photographer Viktor Hanacek. Attribution is requested, but not required. GetRefe: a Tumblr blog of stock photos taken by mobile phone users. Great source for gritty or spontaneous images. Pattern Library: tile-able patterns and backgrounds created by a community of graphic artists. Gratisography: like Picjumbo, Gratisography is a personal project. Photographer Ryan McGuire, of Bells Design, has curated a gallery of his own images and offered them for public use, copyright-free. Instagram: I’ve used several of my own Instagram photos as placeholders in mock-ups, or as accent photos in larger pieces. To download Instagram photos, use Webstagram. Any suggestions of sites to add to this list? Every November, thousands of writers accept the National Novel Writing Month challenge to write 50,000 words in 30 days. At 1,667 words a day, it’s a furious pace. The goal of the challenge isn’t to produce an award-winning novel in 30 days. Instead, NaNoWriMo aims to motivate occasional or “I would if I had the time” writer to complete a sizeable project in a short timespan — no excuses. 2) Find your writing place. It might be a coffee shop, or a spare room in your home. For me, it was the Maria A. Shchuka branch of the Toronto Public Library. Ample outlets, free wifi and close proximity to a Tim Hortons made this a great place for me to crank out thousands of words. Being surrounded by books also helped. 4) Tell everyone you know. During November, I kept myself on track and accountable by chatting about my novel with co-workers, family members, Twitter followers, fellow commuters, friends, my cats and innocent bystanders. 5) Build in downtime. 1,667 words a day is a heavy commitment and I did about 2/3 of my writing during my commute. If I was going to do NaNoWriMo again next year, I would plan to write closer to 2,000 words a day and take five days off throughout the month. In addition to writing, I had other responsibilities throughout the month – volunteering, planning a wedding, hosting my parents for a weekend – and a few days off would have been incredibly valuable. Any other tips to add for getting through November?